Philadelphia's huge 1960's soul output went a long way to filling the record boxes at some of Northern Soul's greatest clubs. Due in no small part to the efforts of Kenny Gamble and Leon Huff, as songwriters, producers and arrangers, there was no shortage of hard driving, melodic classic soul 45's in Philly. 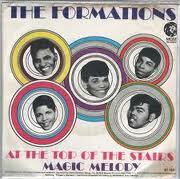 One of the greatest of these groups – though they only ever recorded three 45's – was the Formations. Their 'At The Top of The Stairs' is a Northern Soul classic, so much so that it was reissued in the UK on the Mojo label in 1970 and made it up to number 28 on the UK charts. 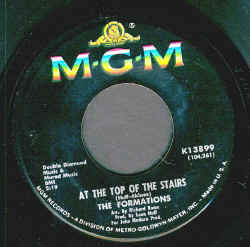 The Formations recording history (under their own name) starts with the release of 'At the Top of the Stairs' b/w 'Magic Melody' 45 on the local Bank label in 1967. 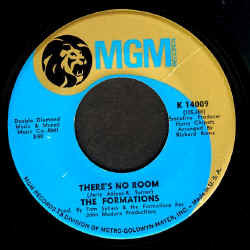 The group, Victor Drayton, Jerry Akins, Ernie Brooks, Reginald Turner and Johnny Bellman, had recorded a previous 45 backing a female vocalist (as Margie & The Formations) on the Coed label. 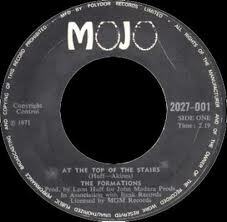 'At The Top of the Stairs' is one of the most melodic and imaginative 45's in the history of Philly soul. Co-written by Leon Huff and Jerry Akins, the tune manages to combine almost baroque pop touches with a solid dance beat and fantastic harmony vocals. 'Magic Melody' (penned by Akins and Drayton) uses the same formula, with flourishes that in the end echoes elements of psychedelic pop from the same era. Early in 1968 MGM records picked up and reissued the 45. Though garnering some airplay in Philly, it never made a dent in the national charts. 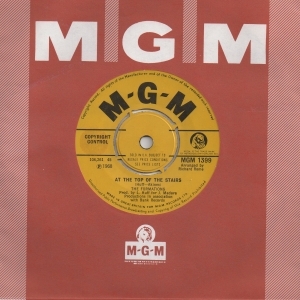 The group recorded their second 45 for MGM later that year. 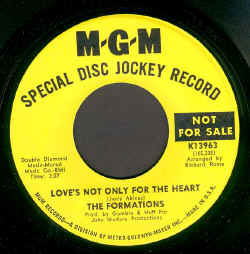 'Love's Not Only For The Heart' b/w 'Lonely Voice of Love' (both tunes written by group members) was produced by Gamble and Huff, and like all three of their MGM 45s, arranged by Richard Rome. 'Love's Not Only For The Heart' is a dynamic, upbeat soul number unlike anything else on their MGM 45s. 'Lonely Voice of Love' is highlighted by the group's beautiful harmonies , as well as harp flourishes and a great horn chart. Despite the fancy touches the tune never strays far from it's strong beat. The third and last MGM release (late 1968/early 1969) was a lot closer to what would become known as the 'Philly Sound' in the next few years, though ironically it did so without the involvement of Gamble and Huff. Both tunes feature lush, romantic harmony vocals (with prominent falsetto leads) combined with complex arrangements. 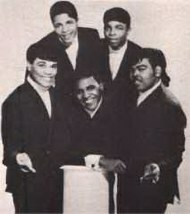 Again, both tunes were written by the group, with 'There's No Room' featuring a complex, interesting melody. Unfortunately, the lack of chart success would see the group drop the Formations name – keeping the same lineup, and work under no less than three different names (for five different labels) over the next five years. Later in 1969 , as 'The Corner Boys (& Friends)' they recorded 'Gang War (Don't Make Sense)' for Gamble and Huff's Neptune imprint. By 1970 they changed their name to the Silent Majority (recording 45s for Hot Wax) and in 1972 they became Hot Ice who recorded for Atlantic. Like the Formations, none of these groups met with any chart success.